Universities around the world are putting a great deal of effort into ensuring accepted applicants go on to become enrolled students. These institutions’ admissions departments are looking for a solution to reduce the amount of admitted applicants who don’t go on to enrol at the start of the academic year. Well-produced content that appeals to your applicants' requirements can encourage them to move to the next stage in the enrolment process. Here are five pieces of content to send to admitted students in lead up to enrolment. 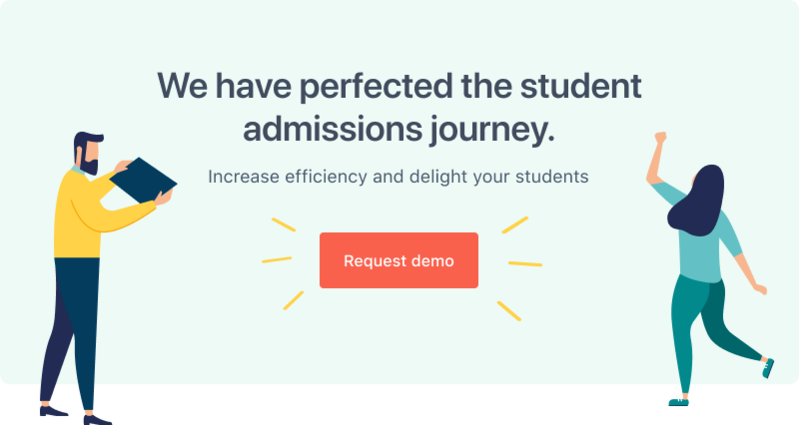 Once students have accepted your offer to study at your university, direct them to a landing page. This page should act as an early step in the enrollment process and welcome the new students to your university’s community. The page should set out the next steps in the enrollment process and make it clear what the applicants need to do next. It should inspire and motivate your prospective students to enrol by conveying the specific things that make your university a unique and rewarding place to study. This period is a stressful time for your applicants, who will have a lot of important decisions to make. It’s important to keep the landing page clean and concise and limit the amount of links to other resources. Good examples include NYU’s welcome page for admitted students and this page on the University of Cincinnati site. Your enrolment pack is a reference guide that goes into more detail about each step in the enrolment process. Aim to produce a concise document of around 15-25 pages. Only include the essential information students will need to: register as a student; arrange payment of their tuition fees; arrive on campus; move into their accommodation; enrol on to their course; and begin attending their classes. Ensure it’s written in plain English and logically organised. Go for quality over quantity: some universities send 60-80 page documents which many students find overwhelming and discouraging. It’s a good idea to send a digital version rather than a print copy. The student can then access it anywhere and can opt to print if necessary. As an example, see University of Kent’s getting started at Kent PDF. Match your admitted students with a second or third-year student with whom they share a common interest: such as degree programme, nationality, career ambitions or extracurricular interest. Introduce admitted students to their mentor by sending a short video. This good way for the mentor to introduce themselves, describe how they can help and explain how the student can contact them. See Aston University’s peer mentor videos as an example. By now, you’ve covered most of the essential information your admitted students need to complete their enrolment. At the stage, it’s important to make them excited about joining your university. Write a blog post about the events taking place during their first term. Cover the big hitters (fresher’s ball) as well as events catering to niche academic and extracurricular interests. It’s a good idea to create a few different versions of the blog so that you can target individuals based on their particular interests, demographic and engagement level. Include lots of high-quality images of past events to illustrate the copy. When it comes to student conversion, it’s crucial to foster a sense of belonging. As we explained in a blog post last April, your conversion rate will benefit if you can make students feel valued at your university. Produce a podcast about your student servicess. For a balanced discussion incorporating multiple perspectives, ensure your guests are a mix of faculty, student union staff, student ambassadors and current students. This blog is part of our weekly tips for university marketing and admissions staff. Read the full series here.